Introducing our newest Fresh Off the Grid contributor: Jen Sotolongo from Messkit Maven. 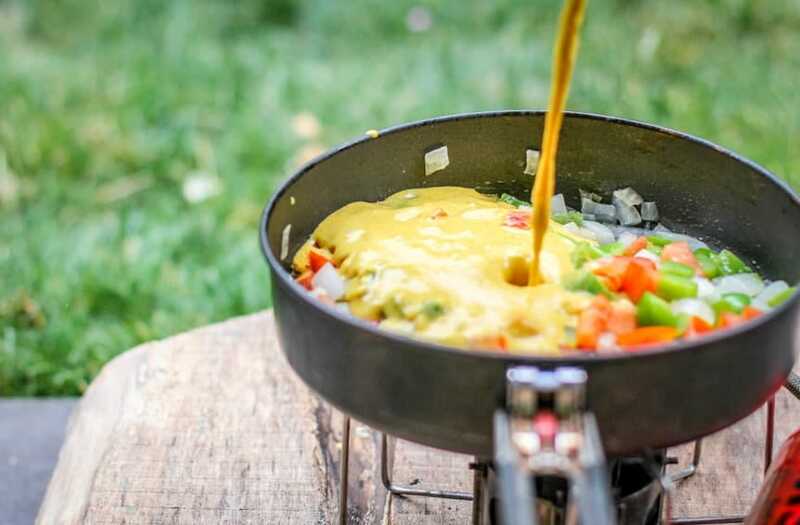 She spent the last two years bikepacking through Europe and South America, making her an expert on quick & easy meals on the road. 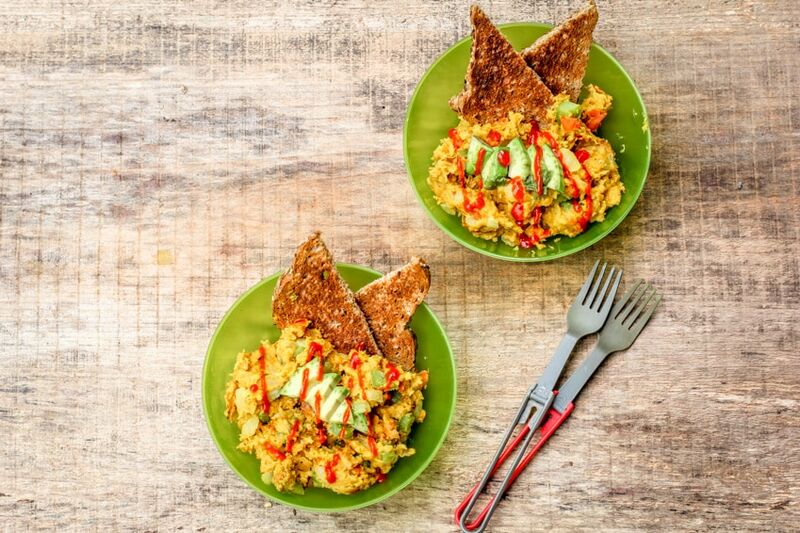 She shares with us a lightweight breakfast recipe for vegan scrambled “eggs” using protein packed chickpea flour. As soon as I walked into Salud Pan in Medellin, Colombia’s Laureles neighborhood, I knew I had found my happy place. In addition to serving exquisite vegan and gluten free fare, Salud Pan also included the largest natural store selection I had seen in my year and a half traveling by bicycle in South America. My eyes widened as they scanned over foods I hadn’t seen in ages: Giant containers of coconut oil, whole grain bread topped with seeded goodness, a bulk section with all the spices I could ever imagine, and grains like farro, bulgur, and millet. I stopped the moment I came across an ingredient I had long wanted to use but had yet to try: Chickpea flour. After eating overnight oats for well over a year during our bicycle tour, our vegan breakfast options had become limited. We needed to prepare something quick in the mornings so that we could be on our way with plenty of time to spare before either the heat or darkness forced us to stop. Time after time on our trip, we would consider renegotiating our vegan diet terms to allow eggs. They’re so versatile, quick to make, easy to find in restaurants, and cheap. But we couldn’t bring ourselves to do it. Once I found the chickpea flour, I knew our dilemma would be solved. 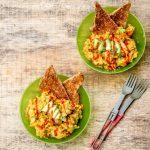 My goal was to create a delicious vegan breakfast scramble that would power our athletic endeavors and also come together quickly. I stuck with the basics for this recipe, using onions, peppers, and a tomato for my veggies. 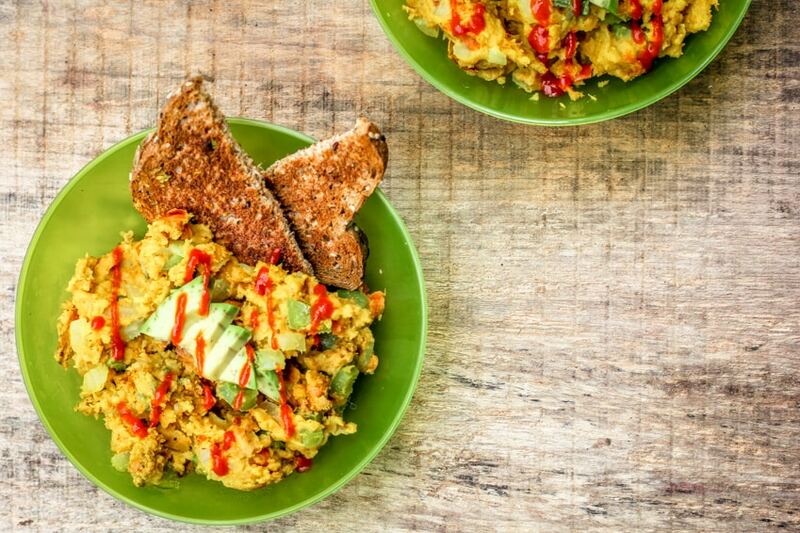 Once those were cooked, I poured in my chickpea “egg” dough and a few minutes later, our vegan breakfast scramble was ready! This recipe uses what may be a few new-to-you ingredients. First up is aquafaba. What the heck is that? Well, you know that liquid you dump into the bushes when you open a can of chickpeas? That’s aquafaba (bean juice, literally translated!) and this magical substance acts just like egg whites. I’m talking meringues, fluffy pancakes, mousse, and pillowy vegan breakfast scrambles. 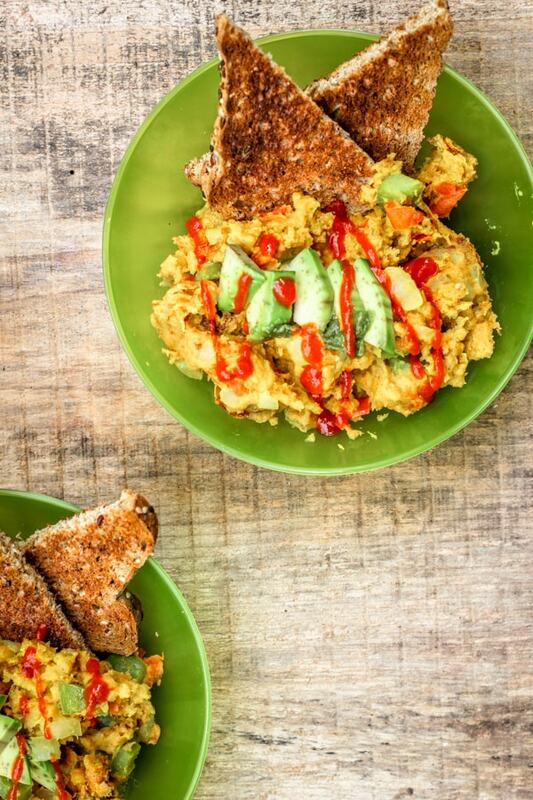 Next, we have nutritional yeast, affectionately known as “nooch.” This is a vegan pantry staple, as it gives a cheesy flavor in dishes, plus it’s packed with B vitamins. And last, but not least is kala namak, or black salt, new to me since my veggie scramble making days. This pungent salt is great to use in vegan egg remixes due to its high content of sulfur resembling the smell of eggs. Don’t buy it at the expensive vegan store like I did. Instead, head to your nearest Middle Eastern market and purchase it there for a fraction of what I paid. One more thing I’ll leave you with is that these are not eggs. On my first go, I had the expectation that they should taste just like the scrambled eggs I’d eat in during my pre-vegan days. They don’t, but they’re a fantastic replacement. Combine all chickpea flour dough ingredients together in a bowl, stir until there are no lumps, and set aside. Heat the oil over medium heat and add the onions and garlic once hot. Stir consistently to avoid burning. Add the pepper about two minutes later, when the onions start to turn translucent and continue to stir. When the peppers have softened, after three minutes, add the tomatoes and stir for about one minute. Pour the chickpea flour dough into over the veggies and into the pan and allow to sit for 2-3 minutes, like you would a regular scramble or omelet until the edges begin to dry out. Scramble the mixture, scraping the bottom of the pan and allow it to sit, undisturbed for another 2 minutes before scrambling again.Continue the process until the dough begins to dry out, 4-5 minutes in total. Kill the heat and allow the mixture to sit in the pan for 2 minutes and break apart into smaller bits if desired. * Aquafaba: This is the liquid that canned chickpeas come packed in. Reserve 3 tablespoons for this recipe when draining the can. ** Nutritional Yeast: This is a deactivated yeast that brings a cheesy flavor to dishes. We've recently seen our Trader Joe's start carrying it, but it can also be found at Whole Foods, natural grocery stores, or online. *** Kala Namak: Black salt. This will add an "eggy" flavor to the dish, but is optional. Find it at Middle Eastern or Indian grocers or online. Jen Sotolongo lives for adventure and food. Most recently, she returned from a two-year bicycle tour across Europe and South America with her dog and partner, otherwise, you can find her running long distances in the woods. When she’s not outdoors, she is crafting culinary delight in her kitchen, wherever that may be. She is a blogger and photographer at Long Haul Trekkers. Follow along @longhaultrekkers. It makes about two servings! We cook our own chickpeas in the instant pot — does anyone have experience with the results using the reserved cooking liquid from the IP for the aquafaba? (it’s a bit more diluted than the thicker liquid you would drain off from canned chickpeas) TIA — excited to give this a go! I haven’t tried this myself, but I would maybe just allow the aquafaba to reduce a bit with the lid off after you have removed the chickpeas. Let me know if you try with the thinner liquid and whether it comes out! Does it taste like eggs? Not exactly. It’s more reminiscent of eggs in terms of look and texture. The kala namak salt helps because it also gives is a sulphur smell so it boosts the senses in that regard as well. I would describe it like I do a veggie burger. It takes like the experience of eating a burger. Hopefully this makes sense! Tried this last week and loved it. I’m allergic to eggs and everything else I tried was just not right. These are perfect Thank you so much. I’m so happy to hear that these worked for you and that you enjoyed them! Chickpea flour is one of my new favorite go-tos for egg replacement. I am so happy to find this recipe! As a vegan, I really struggle with breakfast while camping. I was curious how much protein was in this dish so I ran the ingredients list through the nutritional analyzer tool that I use (happyforks.com) and it came up with a much lower calorie count than what you included. I was wondering how you came up with your number. Thanks so much! Anyways, we reran everything and you are right, the calorie count is lower: 306 Kcal with approx 16 grams of protein. We have updated the recipe. Sorry for the mistake. But thank you so much for catching it. What can I use instead of aquafaba? Hi Carina! You can just add the full cup of water and omit the aquafaba. It might not be quite as fluffy, but the texture change should be unnoticeable and it’ll come out just fine! A beautiful recipe. This has become one of my recipe staples, thank you <3 however i prefer to fry the veg separately and add them to the scramble right before it's fully cooked cos I like my veggies a bit raw. So glad that you have been enjoying this scramble! I bet the more raw veggies add a nice texture to the dish. Wonderfully written. Nice work. Would wait for next one.